Jeremiah xlviii. 8.--"Moab hath been at ease from his youth, and he hath settled on his lees, and hath not been emptied from vessel to vessel, neither hath he gone into captivity; therefore his taste remained in him, and his scent is not changed." THERE is a reference here, it will be seen, to wine, or to the process by which it is prepared and finished. It is first expressed from the grape, when it is a thick, discolored fluid or juice. It is then fermented, passing through a process that separates the impurities, and settles them as lees at the bottom. Standing thus upon its lees or dregs in some large tun or vat, it is not further improved. A gross and coarse flavor remains, and the scent of the feculent matter stays by and becomes fastened, as it were, in tne body of the wine itself. To separate this, and so to soften or refine the quality, it is now decanted or drawn off into separate jars or skins. After a while it is done again, and then again; and so, being emptied from vessel to vessel, the last remains of the lees or sediment are finally cleared, the crude flavors are reduced, the scent itself is refined by ventilation, and the perfect character is finished. So it has not been, the prophet says, with Moab. He hath been at ease from the first, shaken by no great overturnings or defeats, humbled and broken by no captivities, ventilated by no surprising changes or adversities. He has lived on, from age to age, in comparative security, settled on his lees; and therefore he has made no improvement. What he was, he still is; his taste remains in him, and the scent of his old idolatries and barbarities of custom is not changed. Accordingly the prophet goes on to declare, in the verses that follow, that God will now deal with him in a manner better adapted to his want; that he will cause him to wander, empty his vessels, break his bottles, give him all the agitation he needs, and so will make him to be ashamed of the idolatries of Chemosh, even as Israel was made ashamed of Bethel, their confidence. There has all along been a kind of mental reference, it will be seen, in his language, to the singular contrast between Moab and Israel, which here in these last words comes out. Israel, the covenanted people, have had no such easy and quiet sort of history. They have been wanderers, in a sense, all the while; shaken loose or unsettled every few years by some great change or adversity; by a state of slavery in Egypt, by a fifty years' roving and fighting in the wilderness, by a time of dreadful anarchy under the Judges, by overthrows and judgments under the Kings, by a revolt and separation of the kingdom, then by a captivity, then by another; and so, while Moab, heaved and loosened by no such changes, has retained the scent of its old customs and abominations, Israel has become quite another people. The calves of Bethel were long ago renounced; the low superstitions, the coarse and sensual habit, all the idolatrous fashions and affinities which corrupted their religion, have been gradually fined away. Similar contrasts might be instanced among the states and nations of our own time; in China, for example, and England; one standing motionless for long ages, and be. coming an effoete civilization, absolutely hopeless as regards the promise of a regenerated future; the other emptied from vessel to vessel, four times conquered, three times deluged with civil war, converted, reformed and re-reformed in religion, and finally emerging, after more than one change of dynasty, into a state of law, liberty, intelligence, and genuinely Christian manhood, to be one of the foremost and mightiest nations of the world. That we require to be unsettled in life by many changes and interruptions of adversity, in order to be most effectually loosened from our own evils, and prepared to the will and work of God. 1. How God manages, on a large scale, in the common matters of life, to keep us in a process of change and pre vent our lapsing into a state of security such as we desire, No sooner do we begin to settle, as we fancy, and become fixed, than some new turn arrives by which we are shaken loose and sorely tossed. When the prophet declares that He will overturn, overturn, overturn, he gives in that single word a general account of God's polity in all human affairs. The world is scarcely turned on its axle more certainly than it is overturned by the revolutions of Providence. It seems even to be a law, in every sort of business or trade, that nothing shall stand on its lees. Credit is a bubble bursting every hour at some gust of change, What we call securities are as well called insecurities. Titles themselves give way, and even real estate becomes unreal under our feet. Nor is it only we ourselves tiat unsettle the security of things. Nature herself conspires to loosen all our calculations, meeting us with her frosts, her blastings, her droughts, her storms, her fevers, and forbidding us ever to be sure of that for which we labor. Markets and market prices faithfully represent the unsteadiness of our objects. We look upon them as we might upon the sea, and it even makes one's head swim, only to note the fluctuations of all human goods and values represented there. Nothing in the world of business is allowed to have a base of calculable certainty. Unforeseen disasters wait on our plans, in so many forms and combinations, that we are sure of nothing, and commonly bring out nothing exactly as we expected to do. The very scheme of life appears to be itself a grand decanting process, where change follows change, and all are emptied from vessel to vessel. Here and there a man, like Moab, stands upon his lees, and commonly with the same effect. Fire, flood, famine, sickness in all forms and guises, wait upon us, seen or unseen, and we run the gauntlet through them, calling it life. And the design appears to be to turn us hither and thither, allowing us no chance to stagnate in any sort of benefit or security, Even the most successful, who seem, in one view, to go straight on to their mark, get on after all, rather by a dexterous and continual shifting, so as to keep their balance and exactly meet the changing conditions that befall them. Nor is there any thing to sentimentalize over in this ever shifting, overturning process, which must be encountered in all the works of life; no place for sighing--vanity of vanities. There is no vanity in it, more than in the mill that winnows and separates the grain. 2. That the radical evil of human character, as being under sin, consists in a determination to have our own way, which determination must be somehow reduced and extirpated. Hence the necessity that our experience be so appointed as to shake us loose continually from our purpose, or from all security and rest in it. Sin is but another name for self-direction. We cast off the will of God in it, and set up for a way and for objects of our own. We lay off plans to serve ourselves, and we mean to carry them straight through to their result. Whatever crosses us, or turns us aside, or in any way forbids us to do or succeed just as we like, becomes our annoyance. And these kinds of annoyance are so many and subtle and various, that the very world seems to be contrived to baffle us. In one view it is. It would not do for us, having east off the will of God, and set up our own will, to let us get on smoothly and never feel any friction or collision with the will cast off. Therefore God manages to turn us about, beat us back, empty us from vessel to vessel, and make us feel that our bad will is hedged about, after all, by his Almighty purposes. Sometimes we seem to bend, sometimes to break. Be it one or the other, we lose a part of our stiffness. By and by, to avoid breaking, me consent to bend, and so at last become more flexible to God, falling into a mood of letting go, then of consent, then of contrition. The coarse and bitter flavor of our self-will is reduced in this manner, and gradually fined away. If we could stand on our lees, in continual peace and serenity, if success were made secure, subject to no change or surprise, what, on the other hand, should we do more certainly than stay by our evil mind and take it as a matter of course that our will is to be done; the very thing above all others of which we most need to be cured. It would not answer even for the Christian, who has meant to surrender his will, and really wants to be perfected in the will of God, to be made safe in his plans and kept in a continual train of successes. He wants a reminder every hour; some defeat, surprise, adversity, peril; to be agitated, mortified, beaten out of his courses, so that all remains of self-will in him may be sifted out of him, and the very scent of his old perversity cleared. O, if we could be excused from all these changes and somersets, and go on securely in our projects, it would ruin the best of us. Life needs to be an element of danger and agitation,--perilous, changeful, eventful; we need to have our evil will met by the stronger will of God, in order to be kept advised, by our experience, of the impossibility of that which our sin has undertaken. It would not even do for us to be uniformly successful in our best meant and holiest works, our prayers, our acts of sacrifice, our sacred enjoyments; for we should very soon fall back into the subtle power of our self-will, and begin to imagine, in our vanity, that we are doing something ourselves Even here we need to be defeated and baffled, now and then, that we may be shaken out of our self-reliance and sufficiency, else the taste of our evil habit remains in us, and our scent is not changed. 3. Consider the fact that our evils are generally hidden from us till they are discovered to us by some kind of trial or adversity. This is less true of vicious and really iniquitous men; they see every hour with their eyes what is in them, or at least they may, by the acts they do. Their profanities, frauds, and lies, their deeds of impurity and violence, all that comes out of them shows them to be defiled. Not so with a generally correct man, still less so with a genuine, faithful Christian, endeavoring after greater sanctification and a closer conformity to the will of God. Every such man, living a life outwardly blameless, and desiring earnestly to grow in all true holiness, is, by the supposition, correct outwardly, and therefore the evils that remain in his spirit are to a great extent latent from himself. Sometimes, in a frame of high communion with God, he imagines that he is much more nearly purified than he is. And when he knows, from his poverty and spiritual dullness, that something is certainly wrong in him, he will have great difficulty in detecting the precise point of his infirmity. It is in him like some scent in the air, the source of which is hidden and can not be traced. Perhaps he will never definitely trace it so as to have it as a discovery, and yet God will manage, by the gusts of adversity and change, to winnow it away, even though it be undiscovered. More commonly, however, every such turn of adversity will bring out some particular fault in him, which before was hid, and which he greatly needed to have discovered, and he will be able to set himself to the very work of purification by a direct endeavor. What good man ever fell into a time of deep chastening, who did not find some cunning infatuation, by which he was holden, broken up, and some new discovery made of himself. The veils of pride are rent, the rock of self-opinion is shattered, and he is reduced to a point of gentleness and tenderness that allows him to suffer a true conviction concerning what was hidden from his sight. Nor is any thing so effectual in this way as to meet some great overthrow that interrupts the whole course of life; all the better if it dislodges him even in his Christian works and appointments. What was I doing, he now asks, that I must needs be thrown out of my holiest engagements; for what fault was I brought under this discipline? He has every motive now to be ingenuous, for the hand of God is upon him, and what God declares to him he is ready to hear. And ah! how many things that weie hidden from him start up now into view! How could he be allowed to go on prosperously, when there was so much in him and his engagements that required rectification, and ought, if it be not removed, to forever exclude him from these engagements. Perhaps he will be thrown out of them entirely, and turned to something else, that he may there discover, in a second overthrow, other evils that are still hidden from his knowledge. O, it is a great thing with us that our God is faithful and will not spare to set us in order before our own eyes. If he should let us be as Moab from our youth, then should we be as Moab in the loss of all valuable improvement. Better is it, far better that he empties us about on this side and on that, and passes us through all sorts of captivities; for then we are, at least, learning something which is valuable to be known. 5. Too great quiet and security, long continued, are likely to allow the reaction or the recovered power of our old sins and must not therefore be suffered. As the wine standing on its dregs or lees contracts a taste from the lees, and must therefore be decanted or drawn off, so as to have no contact longer with their vile sedimentary matter, so we, in like manner, need to be separated from every thing pertaining to the former life, to be broken up in our expectations and loosened from the affinities of our former habit. In our conversion to God we pass a crisis that, like fermentation, clears our transparency and makes us apparently new; we are called new men in Christ Jesus; still the old man is not wholly removed. It settles like dregs at the bottom, so to speak, of our character, where t is, for the present, unseen. One might imagine, for the time, that it is wholly taken away, and yet it is there, and is only the more likely to infect us that it is not sufficiently mixed with our life to cloud our present transparency. Our sanctification is not to be completed save by separation from it. And therefore God, who is faithful to us, continues to sever us, as completely as possible, from all association with the old life and condition; breaks up our plans, compels a readjustment of our objects, empties us about from vessel to vessel, that our taste may not remain. Otherwise the hidden sediment of the old man will some. time flavor and corrupt the new even more than at first. Suppose a man is converted as a politician--there is nothing wrong certainly in being a politician--but how subtle is the power of those old habits and affinities in which he lived, and how likely are they, if he goes straight on by a course of prosperous ambition, to be finally corrupted by their subtle reaction. 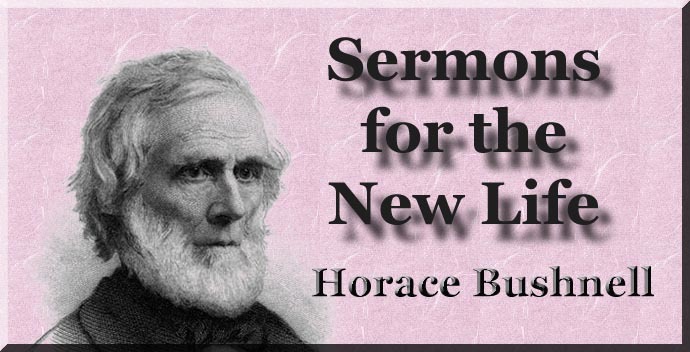 When he is defeated, therefore, a little further on, by untoward combinations, and thrown out of all hope in this direction, let him not think it hard that he is less successful now in the way of Christ, than he was before in the way of his natural ambition. God understands him and is leading him off not unlikely to some other engagement, that he may get him clear of the sediment on which he stands. In the same way doubtless it is that another is driven out of his business by a failure, another out of his family expectations by death and bereavement, another out of his very industry and his living by a loss of health, another out of prayers and expectations that were rooted in presumption, another out of works of beneficence that associated pride and vanity, another out of the ministry of Christ where by self-indulgence, or in some other way, his natural infirmities were rather increased than corrected. There is no engagement however sacred from which God will not sometimes separate us, that he may clear us of our sediment and the re actions of our hidden evils. Were it not for this, were every thing in our trade or engagement to go on perfectly secure and prosperous, how certainly would the old man steal up in it from the bottom where it lies, to corrupt and foul and fatally vitiate the new. This, our God will not suffer, and therefore he continues to unsettle us, tear us away from our works, our gains, our plans, our pleasures, our associations, and not seldom even from our recollections, that our change may go on to completion. Once more, we are most certainly finished, when we are brought closest to God, and we are never brought so near to God as when we are most completely separated from oui personal schemes and objects, and from all the works of the flesh. How tender do we become, when we are loosened by some great and sore disappointment; even as Israel was finally cured of its last vestiges of idolatry by its bitter captivities. Having nothing left of all our expectations, driven out of our places and plans and works, and all that our pride cherished, possibly out of our prayers themselves, because of the pride so cunningly veiled in their guises of sanctity, what can we do but confess that God himself is our all, and take Him as the total blessing of our life. How closely now are we drawn to Him, receiving, as it were, a divine flavor from his purity. And when he is thus brought nigh, how rapidly are we changed in all the secret scents and flavors of our defilement. And now let me suggest as in reference to all these illustrations, how much more they would signify if it were a day with us of great public calamity, a day, for example, of religious persecution, a day when fathers or sons are hunted or dragged to prison, or when possibly we ourselves are expecting every hour to be seized and arraigned for the faith of the gospel--and so to be witnesses for it even by the sacrifice on our lives. O these times of persecution, what Christians do they make! How little hold has this world, or its sins, of men who have laid even their lives upon the altar! We complain how often, that in these days of security and liberty, Christian piety grows thin and feeble, that it loses tone, and appears even to want a character of reality. The difficulty is that our opinions, our faith, our Christian life, cost us nothing, and the church slides into the world because there is no broad palpable line of suffering and sacrifice to separate the two. And for just this reason, how many in our time that have practically lost the distinction, are beginning to be chiefly occupied with Christianity, as a gift to this world; admiring it as a civilizer of society and a promoter of what is called human progress. How many even seem to expect that the modern conditions of political liberty and security, coalescing with and patronizing the gospel, are going to set it onward, and that henceforth the world must be growing into a kind of perfect state, by its own vital forces. Alas, I mistrust this millenium of Moab! it will never be seen. It is not in man, or human society, to be purified, exalted, and finally consummated by any such comfortable and even process. And there is nothing in our present indications to favor such a hope. These times of security and ease, when rightly viewed, are but the lull of the ocean between storms. It were hard to say that times of public fear and persecution are better. God knows what is better and will temper the ages himself. But alas for poor human nature, what does it show more evidently even now, in this short holiday of peace, than the inevitable tameness and feebleness of devotion, when the fires of great public adversity are smothered. Or if we seek to dress up still our giants and heroes in the faith, how shadowy and meagre do they look. And what can we rationally promise, but that our condition of ease and humanitarianism must finally run itself into the ground, preparing some terrible reaction, some war of Gog and Magog that shall empty the church from vessel to vessel leaving her again, as of old, nothing to hope for and look after on earth, but that she may win a better world in the sacrifice and loss of this. The applications of this subject are many and various. First of all, it brings a lesson of admonition to the class of worldly men who are continually prospered in the things of this life. One may be continually prospered in some things when he is not in all. He may be uniformly successful in his business engagements and enterprises, for example, when, iii fact, he is tossed by many and sore disappointments, and shaken by intense agonies of heart. And, by these, he may be kept in that airing of right conviction, which is needed to winnow his bad tempers, and sober his confidence. Far otherwise will it be with you, if you prosper in every thing and are agitated by no kind of adversity. This is the blessing of Moab, and the danger is that, standing thus upon the lees from your youth, disturbed by no crosses, unsettled by no changes, you will finally become so fast-rooted in pride and forgetfulness of God as to miss every thing most dear in existence. Nothing could be more perilous for you than just that which you deem your happiness. Nor is any word of God more pointedly serious than this--Because they have no changes, therefore they fear not God. I commend it to your deepest and most thoughtful attention. Others, again, have been visited by many and great adversities, emptied about from vessel to vessel all their lives long, still wondering what it means, while still they adhere to their sins. There is, alas! no harder kind of life than this, a life of continual discipline that really teaches nothing. Is it so with you, or is it not? Scorched by all manner of adversities, are you still unpurified by the fires you have passed through? Defeated, crossed, crushed, beaten out of every plan, baffled in every project, shut away from every aspiration, blasted in every object your soul has embraced, are you still unprofited? I have known such examples,--fig trees that God has dug about every year, and that still remain as barren as if no hand of care had touched them. Is there any thing more strange, in all the subjects of knowledge, than that a man, an intelligent being, should be nowise instructed by the sufferings of a life?--separated in no degree from the world and self and the scent of his manifold evils, by that which God has sent upon him to correct his understanding, and purify his love, and fashion him even for the angelic glory? So he plods on still, contriving, and failing, and groping with his face downward, and hoping against hope, and wondering that the earth will not consent to bless him. O, poor, weatherworn, defeated, yet unprofited man,--he can not see when good cometh! There is no class of beings more to be pitied than defeated men who have gotten nothing out of their defeat but that dry sorrow of the world which makes it only more barren, and therefore more insupportable. Is it necessary, in the review of this subject, to remind any genuine Christian what benefits he ought to receive in the trials and changes through which he is called to pass? How many are there who are finally driven out of every plan they have laid for their course of life. Their families are dissolved and reconstructed. Their location is dis. lodged. Their business ends in defeat. No kind of settlement is attempted which is not broken up by some kind of change or adversity. And even where there is a measure of prosperity, how many are the changes, losses, trials, surprises, and pains. Do you find, my brother, that, when you are thus emptied about, dislodged, agitated, loosened, you are purified? Or, does the bad flavor of your worldly habits, the scent of your old ambition, or your earthly pride, remain. There could not be a worse sign for you as regards the reality of your christian confidence. And it will be a worse sign still, if you are habitually irritated by your defeats, and even dare to murmur impatiently against the strange severity of God,--as if it were a strange thing for you that your faithful God will try to bring you off the lees on which you stand! A far more strange thing is it that, having no great persecutions to suffer for Christ, you can not find how, as a follower, to endure these common trials, God forbid that you so little understand your privilege il them. Receive them meekly rather, and bow down to them gladly. Bid them welcome when they come, and, if they come not, ask for them; lift up your cry unto God, and beseech him that by any means he will correct you, and purify you, and separate you to himself. But there is a use of this subject that has many times occurred to you already, and to this, in conclusion, let us now come.1 By the visitation of God upon us,--upon you, that is, and upon me,--the tenure and security of our relation as pastor and people has been interrupted now for two whole years. Whether it was God's design, by this interruption, to refine us and purify us to a better use of this relation, or to bring it to a full end, remains now to be seen The former is my earnest hope and my constant prayer Was there nothing in us, on one side or on both, that required this discipline and made it even necessary for us? Ts there no reason to suspect that, in our state of confidence and security, we were beginning to look for the blessing of Moab and not for the blessing of Israel? For myself, I feel constrained to admit that I had come to regard my continuance here too much as a matter of course, an appointment subject to no repeal or change. I had learned to trust you implicitly as my friends, and knew that you could never be less. I had let my roots run out and downward among you, in a growth of nearly a quarter of a century. There was stealing on me thus, as I now discover, a feeling of security and establishment, which is not good for any sinful man, and will not let him be the pilgrim on earth that he ought. Under the semblance of duty and constancy, I had undertaken to die here and nowhere else, knowing no other people, place, or work. And under this fair cover crept a little foolish pride, it may be, that really needed chastisement. As if it were for me to say where I would stay or die! Just here, unwittingly, my imagined constancy became presumption. Furthermore, I had always been too much like Moab, as I now see, and bitterly needed some kind of captivity more real, some change more crippling, than the trivial adversities I had heretofore tossed aside so lightly. Meantime, was there nothing on your part, or in you that required a similar discipline? Having seen your church almost uniformly prosperous for a long course of years, and growing steadily up from a feeble and small one, to a condition of strength, were there not many of you that were losing a righteous concern for it, and beginning to leave it practically to me, as if I could take care of it? ceasing in that manner from their trust in God, by which they had before upheld me, and from those personal responsibilities for it, which are the necessary condition of all earnestness in the christian life? I should do wrong not to say that I have, many times, been so far oppressed by this conviction, as to doubt whether it might not even be better for you, if I were entirely taken out of the way. You have been subjected to some uncommon trials on my account. Have you never slid from the christian constancy and patience in which you stood, into a temper of mere self-reliance, as if by some human sufficiency you had been able to stand unbroken? Were you touched by no subtle pride, were you betrayed into no undue self-confidence, were you slid unwittingly into no trust in a worm that you mistook for trust in God? Ah, if you had been cut down as a church by adversity, crippled, weakened, emptied from vessel to vessel, brought into captivity as regards all hope from man, how much might it have done for you. It is the blessing of Moab, as I greatly fear, that has injured you, and, as God is faithful, he would not let you suffer in this manner longer. And so, both for my sake and for yours, he has brought this heavy trial or adversity upon us. By this he takes us off our lees, and his design has been to ventilate us by the separation we have suffered. He means to purify us, to take away all our self-confidence, and our trust in each other, and bring us into implicit, humble trust in himself. And the work he has begun, I firmly believe that he will prosecute till his object is gained. If two years of separation will not bring us to our places and correct our sin, he will go further. He will finally command us apart and tear us loose from all our common ties and expectations. For myself, I am anxious to learn the lesson he is teaching, and I pray God that a similar purpose may enter into you. Let not this happy return, which God has vouchsafed me, and the congratulations of the occasion, drive away all the sober and searching truths God was trying to enter into our hearts. Be jealous of any such lightness. As you rejoice with me and give thanks unto God for his undeserved goodness, consent with me to God's corrections also, and join me in the prayer that other and heavier corrections may not be made necessary, by the want of all fruit in these. For be assured that, as you are Israel and not Moab, God will deal with you as he deals with Israel, and will not spare till your purification is accomplished. Let us go to him as penitents, in our common sorrow, and make our common confession before him, determined, every one, that he will turn himself to God's correcting hand, and follow it. And as thou hast smitten us, O, Lord, do thou heal us; as thou hast broken, do thou bind us up; that we may be established in holiness before thee, and walk humbly and carefully in thy sight, as they whom the Lord hath chastened. This discourse was so far colored, as a whole, by the peculiar interest of the occasion referred to here in the close, that retaining the occasional matter appears to be required.